As I contemplate the Ralph Waldo Emerson Self-Reliance challenge, ponder the prompts and reflect on myself and my life thus far (something I have been doing for the past few years, since my 2008 layoff), there is always the question of "How Can I do More?" The prompt put forth by Jenny Blake on June 3rd definitely pressed me back into that thinking. Gentle readers, your MatchGirl's biggest challenge right now is a lack of time. There are too many things, personally and professionally that I must do and that I want to do coupled with needing to get some sleep (which is a struggle in itself), your MatchGirl finds that there are really too few hours in the day. So. How to pose that as a question to myself? I'm rarely at home, so I took liberty with the Post-It placement (I'd never see it on my bathroom mirror or the back of the door) and placed a virtual Post-It in the form of a Mac Stickie on my laptop's screen. If there is one place I am for several (upon several) hours a day, it's looking at my computer screen. 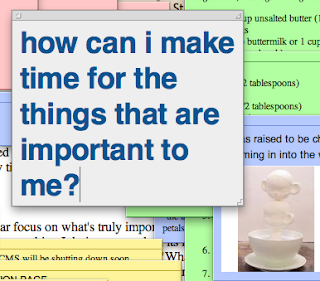 The question I asked myself was this: How can I make time for the things that are important to me? Pretty standard question, I know. It's one working moms and busy dads have been asking themselves for years. I'm neither of those people, But I certainly have been finding myself a bit overextended of late. And I find myself missing out on things that I would really like to do, because my time is packed. And, often, as is so often the case for those of us with jobs that involve working for others, it's not truly my own. So how to make the time? How to make sure I do the things that are important to me, with the limited 24 hours in a day, 168 hours in a week? It's not an easy question to answer, but I think, for me, the key must be saying "no". I want to do everything. I want to attend every event. I want to write every blog post. I want to lend a hand to my over-extended co-workers. I want to assist every friend who asks for my advice or opinion or the donation of my time. But I can't. It's simply not possible. So I need to make sure that I have a clear focus on what's truly important to me. Both personally and professionally. I need to make sure that everything I do is measured on its level of importance. And, sometimes, I need to be a little selfish. Not so selfish that I ask myself "What's in this for me?" but selfish enough that I ask myself, "Is something I"m excited about? Is this something that will make things bigger/better/brighter in the end?" What is important to me is projects and ideas that reflect my passions: building communities; spending time with those I love; focusing on how Boyfriend and I will move forward in the months and years ahead; communicating my passions with people, near and far, in hopes of helping or inspiring them. In order to make sure that I have the time to do what matters most to me, I need to see where what is asked of me fits into those criteria. And go from there. It's not the final answer, of course, dear readers. The question itself is too broad. I know that. But certainly, right now, my greatest challenge, is that of time. What are you doing to meet your biggest challenges?